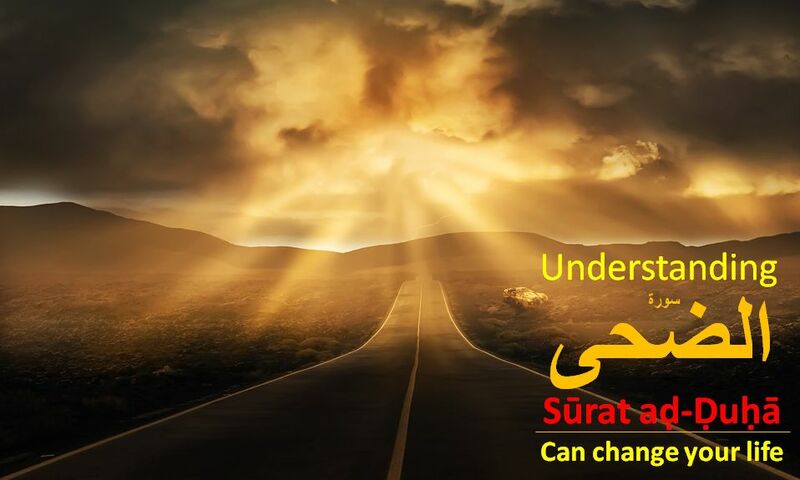 Understanding the Holy Quran: How Surah Ad-Duha Can Change Your Life ~ Islam My Ultimate Decision . Surah Ad-Duha, the 93rd chapter / surah of the Holy Qur'an if understood properly can change a man's life as it did the life of the Holy Prophet Muhammad (peace be upon him) when he was in great distress and low morale. The surah guides the believers and shows them a way out of their despair and low days. We have already presented the exegesis of the Surah Ad-Duha in one of our earlier posts. But the purpose of this post is to share an enlightening commentary on Surah Ad-Duha, wherein it is deliberated upon how one can change one's life if one seeks guidance given in the surah by Allah, the Almighty to His last Prophet Muhammad (peace be upon him) when he was in great despair due to non receipt of the Divine revelations for a number of days and the pagans of Makkah had started to mock the Prophet of Allah that he had been abandoned by the Allah. As per some sources, it is quoted that "Umm Jamil, wife of Abu Lahab, who was an aunt of the Prophet (peace be upon him) and whose house adjoined his, said to him: It appears your Satan has forsaken you." In such trying times, Allah promised His Prophet through this surah that "Soon would follow what is better for you and that you shall be rewarded and given so much that you will be well pleased." This promise was fulfilled during the lifetime of the Prophet (peace be upon him) and all Arabia, from the southern coasts to the Syrian frontiers of the Byzantine empire and the Iraqi frontiers of the Persian empire in the north, and from the Persian Gulf in the east to the Red Sea in the west, came under his control. That is why Surah Ad Duha needs to be understood for it took out the Prophet of Allah from darkness of despair and depression and showed him the light and reminded him that didn't Allah look after him when he was orphan, very young and no one to rely upon. Those were the days when despite all odds, from where he grew up to be a strong young man and a successful businessman and later to be the Prophet of Allah. I am sure after listening to this video, you will be a better man than you were before. May Allah help us to seek guidance from the Holy Qur'an by understanding its meaning and helping others who are in distress by making them understand what we now know.